We had an overnight low of 29.7 Friday night…I feed the humming birds in the morning and the deck was quite chilly on my bare footies. 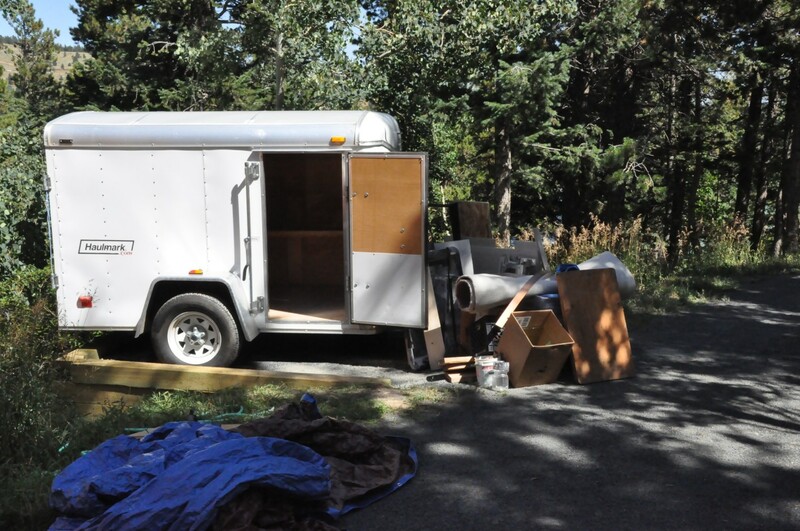 The trailer parking project is complete…well at least enough for this season. I brought in a load of the Grey crusher fines, like I used for the drive last year to top it off. 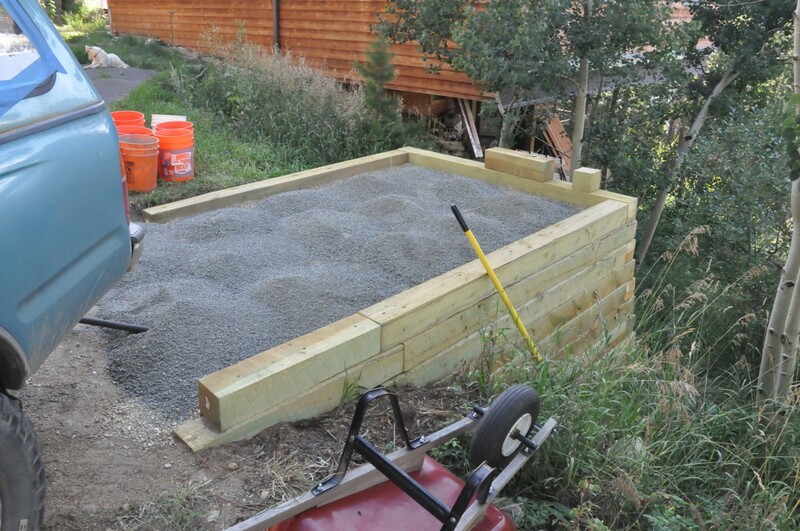 After getting the stone leveled and packed I hosed it down with the hope of letting it set up like the drive did. Eager to get some progress done I went ahead and moved the trailer Friday as well. The gravel was still a bit loose so the trick of walking it in by hand was not to successful. To add some complications the top course of timbers were a bit to narrow…just about an inch on each side… the gradual taper came back to bite me. When I started I had 8 feet of width, near the top it fell just inside the wheel base. About 30 minutes later I had repositioned the top course of the sides and got the trailer in place. Saturday I cleaned out the trailer and did a bit of re-organizing, It had been about a year since I emptied out the trailer. With this cleaning I set the shelf back up inside. 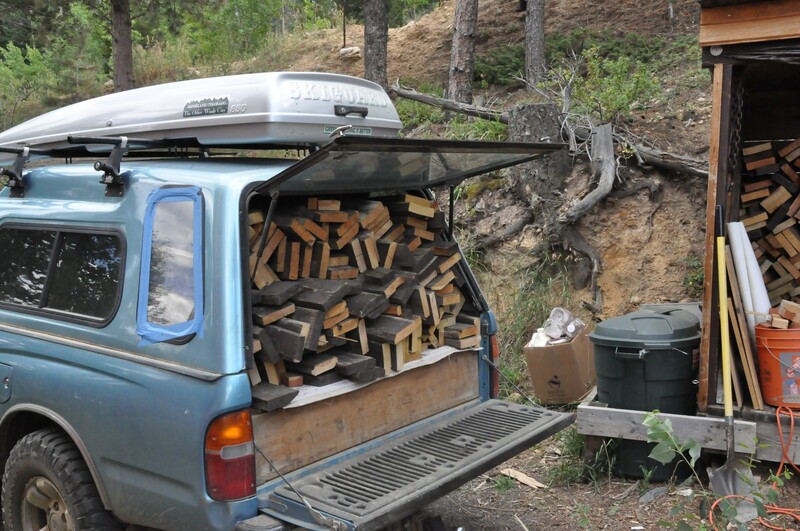 I had it down for the last couple of years after bringing back the Pinon from the ranch. With the shelf back up its a lot easier to store things and still retrieve them without to much digging. Friday before I ran down the hill to get the stone I ran into my neighbor Micheal Bane at the post office. He is pretty famous on the Outdoor channel and hosts a number of shooting programs. When I picked up my cowboy gun last year I had no clue that he also participated in this action sport. A few months ago I stopped by the Boulder range to get a peek at my first cowboy action shooting event. At that time I had just one 6 gun and my new 1873 rifle. Micheal lent me one of his 6 guns and also the Mrs’s shotgun to “shoot” a round between groups. I was a total hoot and led me to continue acquiring some more “man toys”. I picked up my second Vaquero a while after that shoot. One of my next purchases will need to be some leather. The leather I have been using is sized for the black powder guns. Later on Sunday I stopped by the neighbors to look at their leather and holster rigs. Being a bit stoked after watching the second season of “Top Shot” I took some of my brand new ammo and the newer Vaquero out to test it against the steel targets I picked up this summer. To get in some more shooting time I also brought along the 9 shot .22 revolver and the 1858 Remington muzzle loader. When I was out with the girls a couple of weeks ago I did not get much shooting time in…This time it was just me and it was a great to knock down the steel. I lightly dipped into the .45 cal stocks as these run 25 to 30 bucks a box. The paint “chip” pattern varies by each gun. The 45 colt leaves a small dent due to the higher power and flat nose. 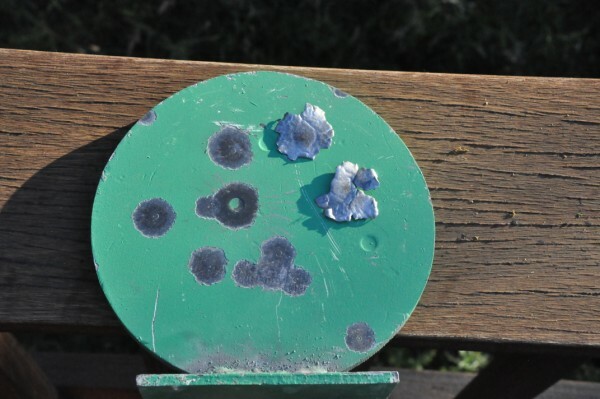 The round .44 cal balls leave an equally large mark but have no big dent. The .22 leaves the little marks and on a few shots actually spun the targets around rather than knock them over. Today I repainted the targets for the next shooting session. The last few times out shooting It has just been the .22 and .45 as the black powder guns stayed home. Shooting the powder again reminds me I need to do that nearly ever time out…despite the added clean up time. The slower pace of the reloads prolongs the experience, consider it a bit of foreplay before the boom. Back home I lined them up for cleaning, and finished off the day. Today I moved the old deck wood from a recent client’s decking project into my woodshed. Two full truck loads. Then off to the store to pick up a pizza for a late lunch / early diner. 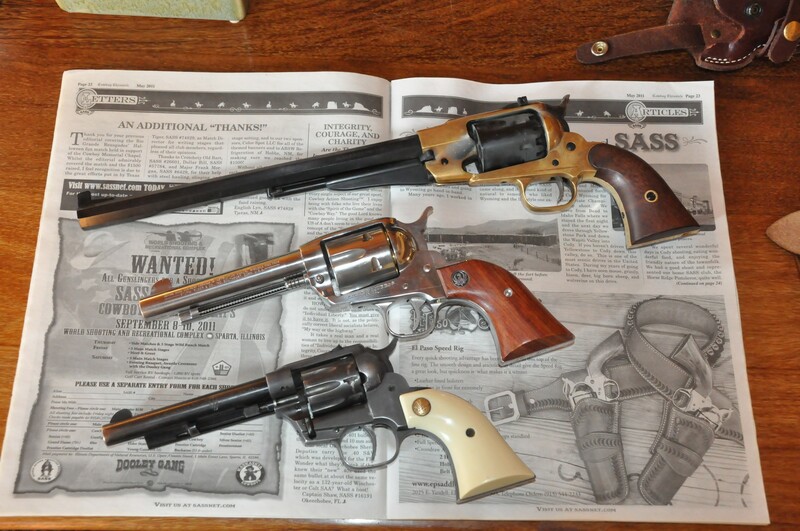 With the SASS newspaper I got from Micheal Sunday I started my research into my wish list for the cowboy rig. I’m thinking about one from Fitzpatrick Leather…the Long Hunter 09. I just need to scrounge up another $450 bucks for more toys.